Monumental genius, frightening commitment, and a willingness to go right to the very edge forged Ayrton Senna da Silva into one of the greatest drivers, and his record for 65 pole positions was still unchallenged more than six years after his death in the San Marino Grand Prix at Imola on May 1 1994.As with Jim Clark, the motor racing world had to adjust to the sudden loss of this mercurial man, but though Michael Schumacher rose quickly to don his mantle, just as Jackie Stewart did Clark's, the Brazilian star's passing took years to fall into its full perspective.Senna narrowly missed the World Championship in karting, having started driving at the age of four, and it rankled forever. But he lost no time in winning in Formula Ford 1600, and then Formula Ford 2000, the moment he came to Europe in the early Eighties. His 1983 season of F3 pitted him against Martin Brundle, but Senna recovered from a self-destructive midseason spell when his enthusiasm and refusal to quit overruled his judgment, to take the title. Tests in Williams, Toleman and McLaren cars simply endorsed the universal view: he was a champion in the making. He graduated the following year with Toleman, quit abruptly to join Lotus for 1985 and then, after his first GP wins, he joined Prost at McLaren in 1988.Only arch-rival Alain Prost exhibited the same interest in the inner workings of his machinery, and Senna's ability to relate to his engineers precise technical feedback, not just from individual laps in different races on different circuits but, even more incredibly, in different years, has long passed into legend. 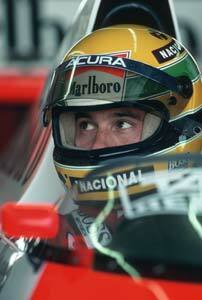 That, and his innate speed and the willingness to push to the point where, at times, even he admitted that he felt as if he was having out-of-body experiences as a warning to ease back, made Senna almost irresistible.Sadly, his tactics often bordered on the reckless, sometimes worse than that. As his teammate at McLaren in 1988 Prost discovered that winning meant everything to Senna when he was almost forced into the pit wall at Estoril at more than 180 mph. In Japan in 1990 Senna's frustration at losing the title to Prost the previous year finally bubbled over as he deliberately rammed the Frenchman's Ferrari out of the Japanese Grand Prix, and thereby recovered the crown he regarded as a birthright.Ruthless and frequently misunderstood, Senna often did his best to hide a softer, highly emotional and compassionate side behind a self-constructed shell of aloofness and aggression. Yet this was the man who wept for Roland Ratzenberger and who, on the day of his own death, planned in victory to wave the Austrian flag as a tribute to his fallen contemporary.